I could go into great details of our day of rest and the fun we had as a team or the traveling details, but like my partner had mentioned on day five, what is the bigger picture? I will leave you with one picture that says it all from the kids of Los Guidos. Today was the final day of VBS (Day #3) and what an awe-inspiring time we had! We even managed to squeeze in a quick party for Sofia after devo. Once we got to Los Guidos, there was still painting going on at the school and food being distributed throughout the community, as we all waited in anticipation to see those "little" faces once again. The view headed to the school where VBS has been held all week. Follow this road through the gate and go up the hill. Just FYI.....In case you're wondering what was on the lunch menu today. It consisted of shepherd's pie, salad, and a piece of banana bread for dessert. Now that we've gotten THAT out of the way. Let's get SERIOUS. I'm really having a difficult time writing to you about this last day of VBS (and I PROMISE it doesn't have ANYTHING to do with the view I have overlooking the ocean). If you ask anyone on this journey, my guess is they couldn't completely articulate all the emotions that filled this day. Some people even stated they weren't prepared to experience such a HIGH level of emotion. As Christians, we know the power that lies within a 3-day period and the same holds true here. Months ago we started out with a purpose and a plan. We met monthly to fine tune all the details of our plan. We performed team-building activities to make our unit MORE cohesive so we could effectively execute and carryout our plan. Even the people with prior CR Mission Trip experience did their part to aid the newbies in order for success to be achieved all around. You know the saying, "Team work makes the Dream work!" It's TRUE! It's all true! You NEED LOTS of elements to go along with a very detailed oriented plan. In addition to that, you need prayer (and LOTS of it!). We prayed for one another. You all surrounded us with prayer. Salva & Veronica prayed. But more importantly, the people we reached last year (and the year before) prayed. Do you have what it takes to explore with Cameron & Jai? The Women Leaders praying for the women who will attend their group today. Mission trips are always so ironic in the sense that you come thinking/believing that you are coming to "give" in this case the people of Los Guidos something (and of COURSE we DID); but the BIG take away is that in 3 days: the word of God was shared, seeds were sown, the love of God was spread, relationships were built & prayers were offered up. I think it's fair to say, "MISSION ACCOMPLISHED!" This was an AMAZING mission trip and all those who took this journey were all hand-picked by God to fulfill this MISSION. There are CERTAINLY tons MORE stories and waaaaaaaaaay MORE pictures than this blog could hold. If you find yourself wanting more information, feel free to talk to anyone of the journey peeps that attended this year's trip. You WON'T regret it! Thanks again for your prayers & support! Pura Vida! Today was another exciting day because it was Day 2 of VBS!!! Yea!!!!!! Okay let us get real for a moment....Yea!!!! It was down right awesome! Our day started just like all the other days with morning devotions then we headed to the school and broke into two teams. One went and did food distributions in the community and the other stayed and cleaned up and painted the school. When the group came back and we rapped up the cleaning and painting, we had the most yummy lunch. It was this Costa Rician version of chicken fried rice and frijoles refritos and chips....oh man! It was like the bomb I'm telling you. With food in our bellies, several last minute team meetings, and a great devotional......VBS baby! 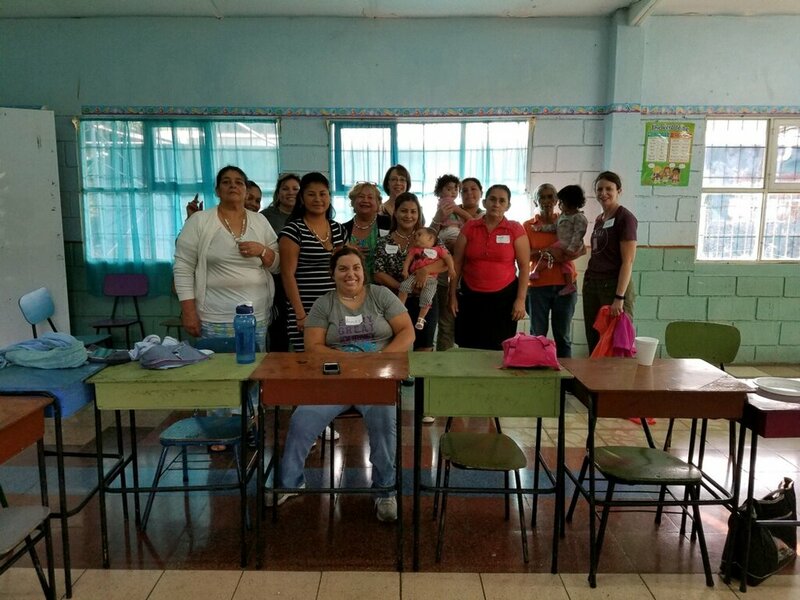 While the kids were having fun making snacks, crafts, and playing games, their moms were being loved on too! The moms got to make a special pillow, fellowship over coffee and cake, and was taught how to reach out to one another through starting a small group. It was fantastic! So here is the recap of Day 4...Day 2 of VBS was a smash, moms hanging out, reached out to the community with food, all food is awesome when nacho cheese in included! Okay my fellow believers, we thank you for your love and support not just for us, but for Veronica and Salva. This ministry that they are working here is incredible. Lives are truly being change for Christ right here and now in Costa Rica. It is awesome to witness where my tithe is going to and how it is being used. The light that they are being here...words truly can not describe. Stayed tuned for tomorrows update! Como estas hoy? How are you doing today? Today is a very exciting day for us because it's Day 1 of VBS!!! We will FINALLY get to see all the faces we've been praying and preparing for. After a wonderful breakfast we met for another PHENOMENAL devotion. Then we headed out to Los Guidos to get our first day of VBS started. Since VBS is held in the afternoon, our morning is filled with lots of activity (i.e. cleaning, painting, & food distribution). Our entire group is divided. A third of the people will go with Salva to distribute food while those remaining will clean and perform various odd jobs at the school. The neat thing is regardless of age, you get to participate and if your are 10 and UNDER (once you're done with your chores of course) you get to go through the streets of Los Guidos inviting people to come to our VBS (with adult supervision of COURSE). There was painting, sweeping, & wiping going on throughout the morning. No matter how BIG or how small, EVERYBODY pitched in to clean it ALL!!! Here's a small glimpse of what Food Distribution looks like. During a Food Distribution visit, Salva introduces the team to the family and we are invited into their home. He usually provides a brief story detailing his relationship with the family. After-which, he will ask the family if they have any prayer requests. Then someone from our group prays for them. It's SUCH a moving EXPERIENCE that if you're NOT already in tears, you soon WILL be. The relationship that Salva & Veronica have established with the families & people of Los Guidos is truly a testament of God's hand at work in their lives. Veronica & Salva have clearly made a MAJOR IMPACT on this Community and Food Distribution is one small way of giving back. Once all the cleaning was done and the Food distribution group got back, we had a wonderful spaghetti lunch! Then it was time for the.......VBS! Although VBS does consists mainly of kids, we are also privileged to have a Teen and a Women's group. pictured here are some of the teens with a couple of their group leaders. The Women's group was led by a dynamic team (Ashley, Esmerelda, LaDonna, & Leigh) and consists of Mothers, soon-to-be Moms & Grandmothers. VBS starts with check-in and station activities (coloring, sticker sheets, bean bag toss, parachutes). From there we go to large group where we sing songs, dance, and watch a skit that proclaims the Good News. is UNSTOPPABLE with Chyanna, Kelli, & Meredith. Large group wouldn't be complete without a skit. We wrapped up the day back in gym (large group area). After a couple more songs, Salva closes us in prayer then gives another "ROLL TIDE" (yes, EVEN in Costa Rica there are TIDE fans) and tells the kids "Hasta Manana!" VBS Day#1 is in the books! The Gospel was shared, seeds were planted, and it was GOOD! It doesn't get ANY better than this. Please continue to pray for all that God is doing here. Pray for the strength of the group and pray that MANY lives will be transformed. VBS Day#2 "What's in store?" stay tuned for updates..
DAY DOS is in the books and what a great day it was! We started our day just like we do everyday with group devotions helping us keep our eyes on Him! Because peeps, that is what we should be doing anyways right? Our devo's are lead by two wonderful souls Brandi Sherman and Jill Morgan, helping us set the tone for each day. After the morning devotions, we broke into two groups to do a little shopping for both VBS and food distribution. Ok let's be real...the food distribution was monumental and very efficient. Wow! Everyone had fun. Maybe some companies or our government should take note...just saying. After our shopping journeys, we gathered and worked on getting ready for VBS. Then we headed to the school to clean and get ready for our time with the kids. When we were done, we ended our cleaning day just like how we started our day...praying for the kids that will come, for the school, and for our hearts to be ready to love on them. Our time here is fun, packed, and truly awesome. Costa Rica is amazing, the people are welcoming, and God is just grand. More fun stuff coming so stay tuned for day three! Or shall I say, "Hey Y'all!" since you're reading this from Alabama? Either way we wanted you to know that the Costa Rica 2018 Trip is well underway. As with ANY trip you go on you have things that are totally out of your control. (i.e. arriving/departing on time, who you'll sit NEXT on the plane, whether or not you'll get a snack on the plane, will you receive your luggage, etc...) Which IS EXACTLY how God wants us to operate in ALL things in order for us to truly TRUST in HIM. I think if you poll anyone during travel day of ANY trip, you'll hear words like: "Tiring", " Exhausting", "frustrating", "Crazy", and /or "Chaotic". I'm even CERTAIN that some of these words lingered in our thoughts as we were traveling because I THINK it's just natural instinct to have words like these on reserve and at the ready. However, this time is DIFFERENT and I mean that honestly & SINCERELY. I have had the distinct privilege of coming to Costa Rica for the past three years and EVEN I was AMAZED! See I KNOW the "Hardwork/Preparation" that actually goes into making a trip like this go well. We polled some people in our group and these are the words they offered: "Peaceful", "Stressless", "Hard-working", "Awesome", & "Unbelievable!" (Now this is where you ask yourself, "Why didn't I go on THIS trip?") I'd like to add that 3 of these words are from people who are visiting Costa Rica for the first time OR this is their 1st Missions Trip. WOW! Would you look at God! We are LITERALLY watching Jeremiah 29:11 unfold right before our very eyes. We're live in Costa Rica reporting that Life is Good and that God is UNSTOPPABLE! From the moment we stepped foot out of the airport (with ALL luggage in hand), we were welcomed with joyous smiles & hugs from Veronica, Josue, & Salvador (for those of you who MAY be worried that Sofia was MIA during the smile/hug fest......she was strapped in her car seat safely on bus. She gave hugs later). Here we are enjoying lunch that was prepared especially for us. Looking back, it's hard to believe that we went from this (see below) to this in just a few short hours. Before we got off the plane Mike, the Flight Attendant, announced over the loud speaker for Oliver to come to the front because they had something "SPECIAL" just for him. Turns out Oliver was getting a personal hands-on view of the cockpit from the pilot. The look on his face as he got off the plane was priceless. He was grinning from ear to ear and back again! It was such a small gesture in the grand scheme of things; but it made such a HUGE impact on Oliver's life. It subtly reminds me of all the people that God has hand picked to be on this trip. Whatever small task that we are asked to do while here on this trip, God can use it to do something BIG. You make be thinking you're NOT qualified to go on a missions trip or you don't possess enough skills/education. in the grand scheme of things, all God wants is a WILLING vessel. We especially want to thank each of you for all your prayers and your support for this trip. We CERTAINLY couldn't make it without you. Continue to pray that God will do some AMAZING things in us and through us. Pray also that we continue to be purposeful in all of our thoughts and deeds.